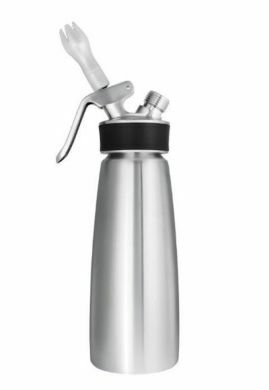 iSi Profi 0.5 litre whip cream whipper made from hygienic, dishwasher-safe, brush-finished stainless steel. The Profi Whip makes whipped cream in coffee shops around the world. For hot sauces or espumas we recommend the iSi Gourment Whip, iSi Thermo-Whip or Mosa all Stainless Steel whipper. 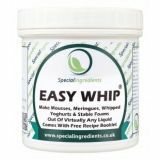 Suitable for use with Best Whip/Mosa cream chargers. Optimised dispensing valve, with a 'Tulip' nozzle, for precision dispensing even for small servings. Silicone head gasket ensures an airtight system - meeting the highest food safety and quality standards. Durable metal charger holder in chrome design. Supplied with 'Tulip' shaped decorator only - other shapes are available from us. Height - 291mm. Width - 79mm. We stock a complete range of ISI Spare Parts. For use with standard 8g N2O chargers only (NOT included).